Fibromyalgia tender points are 18 localized areas of the body where patients experience sometimes extreme pain or discomfort when touched. Doctors have found that many of their fibromyalgia patients have tenderness in these areas. To some, this has been a very effective diagnostic process. These tender points were eventually recognized by the American College of Rheumatology in 1990 to be an effective fibromyalgia test or diagnostic tool. The cause of pain in these areas is unknown, but they are generally present in a large percentage of patients. 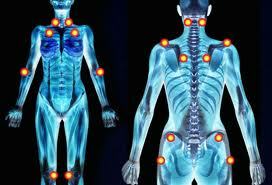 They are also referred to as fibromyalgia pain points or fibromyalgia pressure points. These tender point areas are no bigger than a penny and can sometimes be extremely painful to the touch. They are located in areas around your neck, chest, shoulders, hips, knees and elbows. This method requires someone to apply finger pressure just enough to cause their fingernail to turn white. Some doctors will use instruments called a "doximeter" or a "dolorimeter" to help measure the correct pressure to apply during their examination. In order to be given a fibromyalgia diagnosis, you must experience pain when pressed in 11 out of the 18 tender point locations shown in the above diagram, and also have widespread pain throughout the body for three months or more. Fibromyalgia tender points are sometimes called fibromyalgia trigger points. To many; this is incorrect. Tender points tend to be soft, and the pain is localized. Trigger points tend to be hard painful knots in muscle tissue located in different areas of the body which causes pain to radiate outward. They're also found in areas of the body outside of the 18 localized tender point areas, so this is where the debate begins. Trigger points are generally present in people diagnosed with Myofascial pain syndrome, which many experts beleive is related to fibromyalgia. You'll hear or read many different opinions on this subject, but as you learn more on this site, you'll be able to understand why some have come to this conclusion. familiar with fibromyalgia, they'll be able to examine your symptoms and both tender or trigger point areas to help them come to an accurate diagnosis.